The thyroid gland produces two hormones, T4 (poorly active) and T3 (most active). The pituitary gland constantly monitors the circulating levels of T4 and T3, secreting TSH whenever the levels of either hormone drops below a certain threshold. Hypothyroidism is a condition in which the thyroid gland does not function adequately due to inflammation (e.g. Hashimoto’s thyroiditis), surgery or other causes. In most patients this is diagnosed by detecting elevated levels of TSH in the blood. 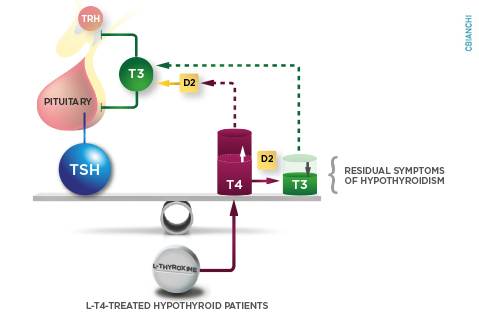 At first glance, treatment for hypothyroidism seems straightforward; administration of daily tablets of levothyroxine, the pharmaceutical grade of T4, is often recommended. The rationale for this so called ‘monotherapy’ approach is two-fold: (i) most thyroid hormone produced by the thyroid gland is T4 and (ii) most circulating T3 is actually produced outside the thyroid gland via deiodination of T4, i.e. removal of one atom of iodine from the T4 molecule to generate T3. The main goal of levothyroxine monotherapy is to normalize the serum TSH level; the deiodinases are expected to normalize serum T3 on their own. Most hypothyroid patients respond very well to this approach. However, for about 10-15% of patients, this strategy doesn’t resolve all symptoms despite achievement of normal serum TSH and T4 values. This phenomenon has been observed since levothyroxine became the standard of care for treatment of hypothyroidism – about 40 years ago – and it has been difficult to reconcile. It is true that many of the symptoms of hypothyroidism, such as low energy, slower metabolism, and fatigue, are also commonly observed in other conditions, for example in women during climaterium, the syndrome of endocrine, somatic, and psychic changes occurring near menopause. In addition, depression is prevalent in the general population and can lead to similar symptoms. Thus, most scholars have assumed that residual symptoms of hypothyroidism are not necessarily due to failure of the monotherapy with levothyroxine, but rather confounding with other common conditions. Clinical evidence indicates that not all parameters are normalized in patients receiving levothyroxine replacement therapy. Once the circulating TSH level is normalized, the T4 level in the blood stabilizes at a relatively higher level whereas T3 in the blood stabilizes at relatively lower levels. In fact for about 15% of patients on levothyroxine monotherapy, T3 levels remain below the normal range. We now recognize that T4-to-T3 deiodination is more efficient in the brain/pituitary gland than in other tissues that supply T3 for the circulation. Therefore, TSH levels can be normalized by relatively high circulating levels of T4 and lower T3 levels. Could this relative reduction in serum T3 be important clinically? In other words, is this why some patients on levothyroxine monotherapy remain symptomatic despite having normal TSH levels? Although this has not been clearly demonstrated in the existing clinical trials, it is almost intuitive to answer YES given that T3 is the biologically active form of thyroid hormone. Interestingly, pre-clinical data in rats support the hypothesis that achievement of normal levels of serum T3 may be important in the management of hypothyroidism. There are clear, quantifiable, signs of hypothyroidism in many tissues of the body including the brain, liver and skeletal muscle that persist in thyroidectomized rats treated with levothyroxine monotherapy. Remarkably, these tissue markers are normalized in rats by the addition of liothyronine, the pharmacological grade of T3, in a regimen that we call ‘combination therapy’ (levothyroxine + liothyronine). This approach has been studied in clinical trials as well but most studies failed to reveal strong differences in outcomes. Of course the study of humans is not as straightforward as with rodents, as we are not able to routinely obtain tissues to assess for these markers of hypothyroidism and thus most studies rely on subjective measures of patient preference. Other factors may play a role in determining patient response to levothyroxine monotherapy. A relatively common genetic polymorphism in the type 2 deiodinase has been identified that results in the change of a single amino-acid in a critical loop of the deiodinase protein. In one clinical trial, only hypothyroid patients carrying this polymorphism exhibited favorable outcomes on combination therapy. Although more studies are needed to help us understand the impact of this polymorphism, it is possible that this genetic factor may guide our ability to determine which patients may benefit from combination therapy for treatment of hypothyroidism.